Our journey was in pursuit of any body of water that might be open. It wasn’t easy as the winter cold and longevity persisted longer than normal, forcing fish, anglers, and lake life to wait in dormancy for warmer weather. 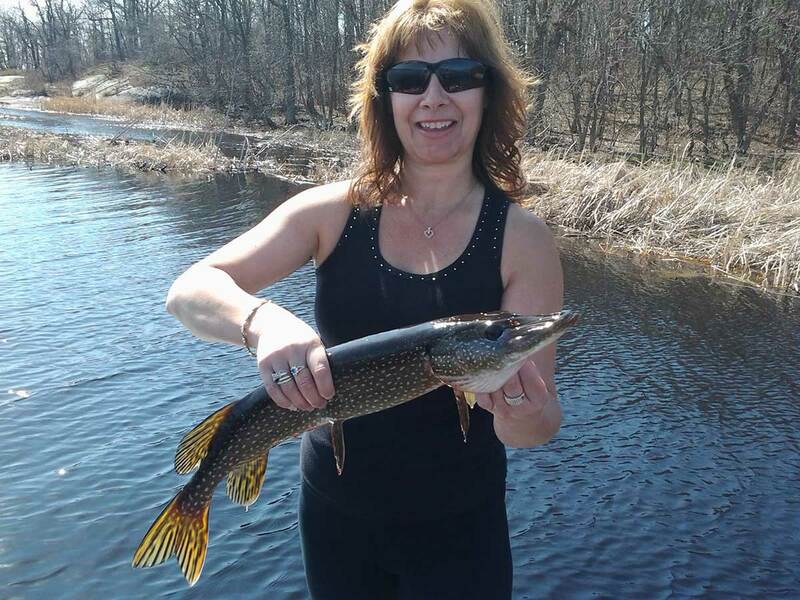 With many conversations with other anglers and research we found a lake and river clear of ice in the Whiteshell area just past Seven Sister’s dam, Dorothy Lake (still with ice) and Otter Falls, called Heart Lake. How befitting for the first time out and enjoying my passion of fishing! As any angler would know the first time out on the boat after its hibernation is always a gamble, regardless of winterizing and summerizing. The cold affects everything. Therefore that first time out is always a trial, I have heard of boat motors seizing up that first day as the oil line gets twisted or plugged. Fuel gets contaminated or condensation builds up , gums up and plugs up fuel lines, fuel injections and leans out for no power or pistons popping. Our only problem was one of the batteries didn’t make the winter, cells, plates probably fused together; our battery readings indicated 9.8v on one of the batteries and wouldn’t take a charge. One battery out of 4 isn’t a bad sore after our severe cold weather. Once out on the lake, what an amazing feeling! The motor purred contently in operation and doing what it does best. The trolling motor was slower than normal due to the lack of volts on one of the batteries but did its job for the day. An electronic switch for the live well pump also broke nearing the end of the day, from turning brittle from the cold winter, small and fixable things, but a necessity for the avid angler, whose gear needs to be in top performance. The water was at a higher level and fast moving current due to spring runoff, cold too, when we first began our fishing expedition, a water temperature reading of two degrees Celsius. Brrr! The sun warmed us up with a morning time air high of 10C. By the end of the day as the clearer skies and sun shined down on us, the outside temperature reached for the day was 23C Yahoo!!! By the time we left, 7pm, the water temperature had reached 5C. Another bonus as the fish came alive in the latter half of the day! Our lures of choice began with crankbaits and large-sized swimbaits, casting close to an island surrounded by reeds and bull rushes, windy spot as well, depth of 3 to 8 feet, to no avail. We trolled for an hour or so checking out the equipment and its functionality at the same time after its six months of dormancy. We continued through the day with crankbaits and switching up and alternating with a jig and artificial night crawlers, my favorite. Interestingly I was fishing with a pro bass angler, accredited Mr. Guyle Sternat, from California, now a resident of Winnipeg, who has won many bass tournaments in his time and is extremely passionate about finding largemouth bass. Listening to his stories big and wide of catches legendary in size in these parts of the continent. Southern States are just not subjected to our seasonal dormancy; therefore grow 12 months a year. His keen interest and passion are well entrenched in his thoughts and life. I on the other hand am always in pursuit of walleye. I learn to adapt and make due to his boats tackle and wears but forever dreaming of my favorite walleye lures left in the SUV. Ahhhh... He is kind and finally sees me flinch when another bass lure is presented. LOL. He now understands. We finally are in sync. Phew! Otherwise, if tension builds, it could jeopardize a good fishing location or worse taken to cast in six-inch deep ditches only to find minnow-sized fish! Proceeding through the river channel, from the lake we find some amazing coves, with depths between 3 to 8 feet, and surrounded by reeds and weeds. The river depth is between 9 to 30 feet in some places, but to no avail. Our first luck struck with a crankbait cast close to shore and reeds, our first of three is a hungry northern pike, approx. 34 inches. Our catches are approx. 34, 36 and 42 inch in size all northern pike. I wonder if the fish gods could see our minor conflict of bass versus walleye and brought forward a neutral species of catches for peace and harmony of this fine fishing day!